Polycomb group (PcG) proteins are evolutionarily conserved epigenetic repressors of developmental genes. PcG-mediated gene silencing involves at least two distinct enzymatic activities directed to histone tails: the first mediates Histone H2A mono-ubiquitination at K119 (H2AK119ub1) by the polycomb repressive complexes 1 (PRC1), while the second mediates H3 tri-methylation at K27 (H3K27me3) by the polycomb repressive complex 2 (PRC2) (Cao et al., 2002; Czermin et al., 2002; Kuzmichev et al., 2002; Müller et al., 2002; Shao et al., 1999; Wang et al., 2004). According to the canonical view, H3K27me3 deposition by the EZH1/2 (enhancer of zeste homologs 1 and 2) histone methyltransferases leads to binding of the H3K27me3-reader protein CBX2 (chromobox protein homolog 2), in turn facilitating sequential recruitment of canonical PRC1 (cPRC1) (Bernstein et al., 2006; Cao et al., 2002; Czermin et al., 2002; Fischle et al., 2003; Kuzmichev et al., 2002). Conversely, H2AK119ub1 deposition by the non-canonical PRC1 (ncPRC1) promotes downstream recruitment of PRC2 and H3K27me3 (Blackledge et al., 2014; Cooper et al., 2014). Myriad other accessory molecules interact with both PRC1 and PRC2, conferring robustness and reversibility to PcG-mediated gene repression (Li et al., 2011). The molecular complexity underlying PcG-mediated gene silencing could be partly explained by the diversity of the PCGF factors (from PCGF1 to PCGF6) that directly associate with RING1A/B proteins. For example, canonical PRC1 (cPRC1) may include PCGF2 (also known as MEL18: melanoma nuclear protein 18) or PCGF4 (also known as Bmi1: B cell-specific Moloney murine leukemia virus integration site 1). These cPRC1 complexes can be further classified into specific sub-complexes according to their association with CBX (CBX2/4/6/7/8) or PHC (PHC1/2/3: polyhomeotic homologs 1, 2 and 3) (Gao et al., 2012; Vandamme et al., 2011). CBX proteins contribute to recognition of H3K27me3, and therefore mediate recruitment of cPRC1 into target loci; while PHC proteins mediate gene compaction through polymerization of the SAM (sterile alpha motif) domain to facilitate transcriptional silencing (Isono et al., 2013). Non-canonical PRC1 (ncPRC1) associates with PCGF1, PCGF3, PCGF5 or PCGF6 and RYBP (RING1 and YY1-binding protein) or YAF2 (YY1 Associated Factor 2), but does not interact with CBX2/4/6/7/8 or PHC1/2/3 (Gao et al., 2012). In addition to the core subunits RING1A/B and PCGF1, ncPRC1-containing PCGF1 (PCGF1-PRC1) also incorporates KDM2B [Lysine (K)-Specific Demethylase 2B], BCOR (BCL6 Corepressor), BCORL1 (BCL6 Corepressor-Like 1), RYBP, YAF2 and SKP1 (S-Phase Kinase-Associated Protein 1) (Farcas et al., 2012; Gearhart et al., 2006). Non-canonical PRC1 complexes are functionally linked with their canonical counterparts (cPRC1), and most of their target genes overlap with each other (Blackledge et al., 2015). These overlapping genes often possess unmethylated CpG islands (CGI) in their promoters, and these are preferentially bound by the CXXC (two cysteines separated by two other residues) domain of KDM2B via recognition of unmethylated CpG dinucleotides (Farcas et al., 2012; He et al., 2013; Wu et al., 2013). KDM2B binding to target genes allows direct recruitment of PCGF1-PRC1, followed by binding of PRC2 through recognition of H2AK119ub1 (Blackledge et al., 2014; Cooper et al., 2014). As PRC2 further recruits cPRC1, non-canonical PCGF1-PRC1 can therefore activate the PRC2-cPRC1 axis to ensure robust transcriptional silencing of developmental genes that harbor unmethylated CGIs. Another PCGF homolog, PCGF6, was first identified in a multimeric protein complex associated with the E2F6 transcription factor (Ogawa et al., 2002). 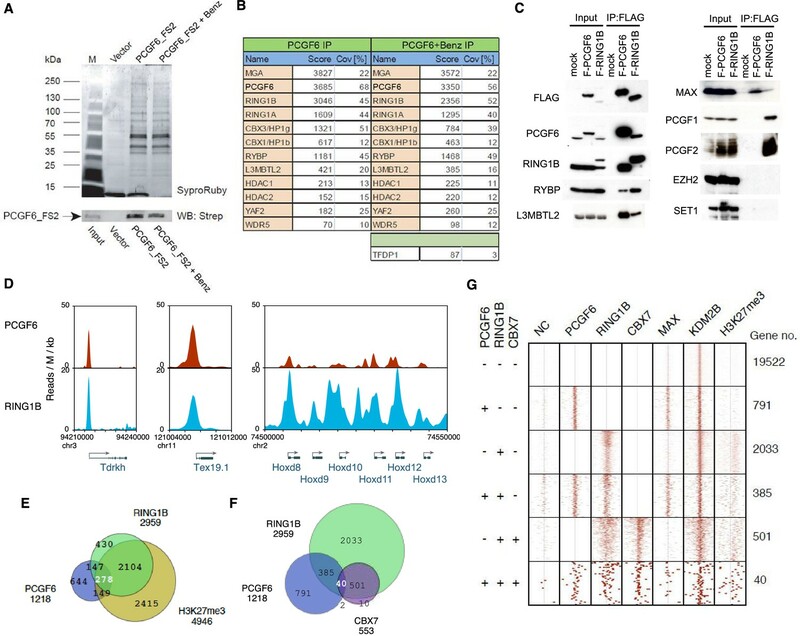 This complex was annotated as PCGF6-PRC1, and was shown to form stable complexes with several other well-known epigenetic factors such as RING1A/B, PCGF6, L3MBTL2 [lethal(3)malignant brain tumor-like 2], RYBP, YAF2, G9A (also known as EHMT2: euchromatic histone-lysine N-methyltransferase 2), GLP (G9a-like protein 1, also known as EHMT1), and CBX1/3 (Gao et al., 2012; Hauri et al., 2016; Kloet et al., 2016; Ogawa et al., 2002; Qin et al., 2012; Trojer et al., 2011). Interestingly, PCGF6-PRC1 also interacts with sequence-specific DNA binding proteins such as E2F6, MAX, MGA and TFDP1 (transcription factor Dp-1) (Gao et al., 2012; Hauri et al., 2016; Kloet et al., 2016; Ogawa et al., 2002; Qin et al., 2012; Trojer et al., 2011). This suggests that such DNA binding proteins could play a role in sequence specific recruitment of PCGF6-PRC1 to target loci; however, this notion has not been experimentally validated. 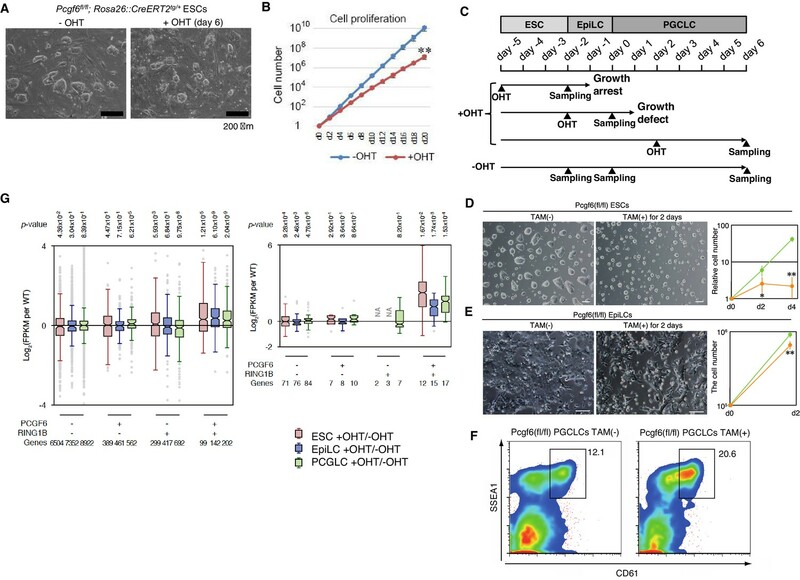 In this study, we therefore purified the PCGF6-PRC1 complex and examined the contribution of PCGF6 to ESC maintenance and embryonic development. We demonstrate that PCGF6 mediates repression of target genes by recruiting RING1B and facilitating H2AK119ub1. 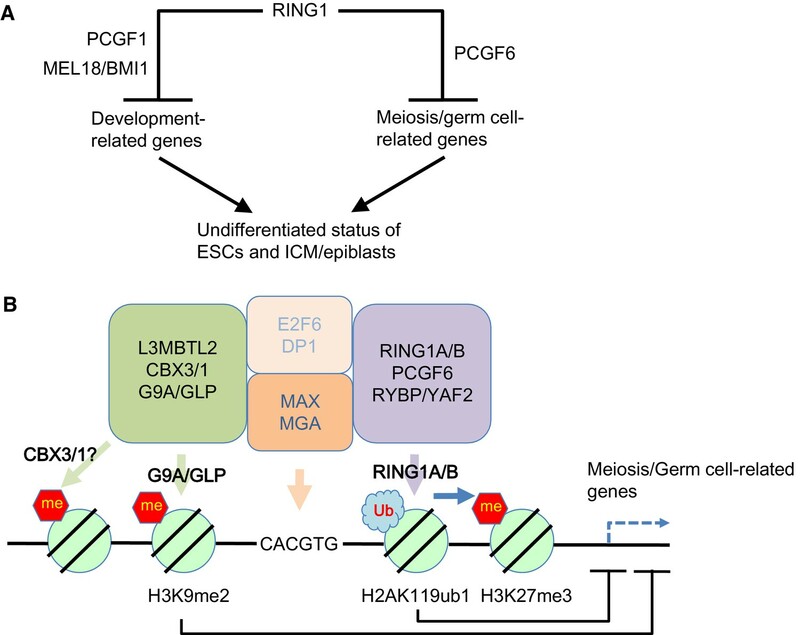 Taking advantage of a Pcgf6 conditional allele, we show that PCGF6 and RING1B common targets are enriched for meiosis- and germ cell-related genes in ESCs, and that such genes are robustly de-repressed in the absence of PCGF6 (Pcgf6-KO). Importantly, silencing of germ cell-related genes by PCGF6 likely plays a role in proliferation and growth of ESCs. We further demonstrate that PCGF6 is involved in pre- and peri-implantation mouse development. Indeed, loss of Pcgf6 leads to pleiotropic defects in vivo, including aberrant axial development and impaired placenta formation. We also reveal a unique recruitment mechanism amongst PRC1 complexes whereby PCGF6-PRC1 utilizes its MGA and MAX components as a heterodimeric DNA binding module to directly recognize and repress expression of germ cell- and meiosis-related genes to support ESC maintenance and embryonic development. 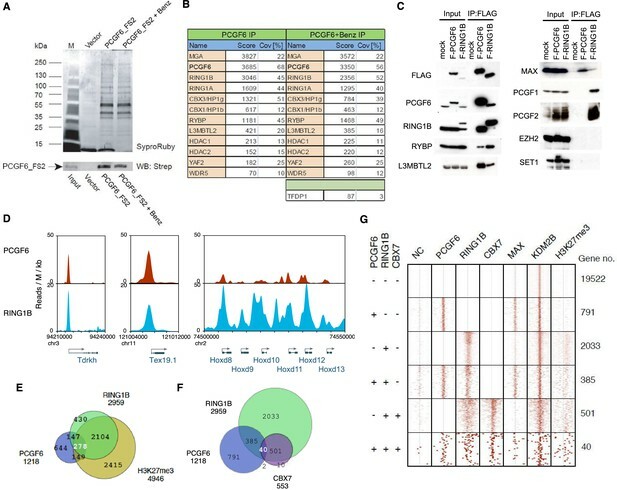 Previous proteomic approaches have repeatedly identified PCGF6 as a component of multimeric protein complexes designated as PCGF6-PRC1 that included MAX, MGA, E2F6, TFDP1, RING1B, RING1A, CBX3, RYBP, L3MBTL2, YAF2 and WDR5 in human cell lines (Gao et al., 2012; Hauri et al., 2016; Ogawa et al., 2002; Trojer et al., 2011). To address the composition of PCGF6 complexes in mouse ESCs, we stably expressed an epitope-tagged form of PCGF6 in mouse ESCs and affinity purified it from nuclear extracts, then used LC-MS/MS analysis to identify associated proteins. We observed strong association of PCGF6 with MGA, RING1B, RING1A, CBX3, CBX1, RYBP, L3MBTL2, YAF2 and TFDP1 (Figure 1A,B), indicating that the mouse ESC PCGF6 complex is similar to those purified from human cells (Gao et al., 2012; Hauri et al., 2016; Kloet et al., 2016; Ogawa et al., 2002; Trojer et al., 2011). We however did not detect considerable amounts of MAX in the PCGF6 complexes in mouse ESCs. Biochemical properties of PCGF6-PRC1 and its target genes in ESCs. (A) Affinity purification of PCGF6-containing complexes in ESCs. To purify PCGF6 and associated proteins, a mouse ESC cell line stably expressing Flag-2xStrepII (FS2)-tagged PCGF6 was generated. Nuclear extract was isolated from this cell-line, PCGF6 was affinity purified, and the purified proteins were subjected to mass spectrometry. Purified PCGF6 fractions were resolved by gradient SDS-PAGE and visualized by SyproRuby staining. The purifications were performed in the absence and presence of benzonase (Benz) to exclude DNA-mediated interactions and a cell line containing only the empty vector was used as control for non-specific binding to the affinity matrix. The elutates were probed by western blot for streptavidin (Strep). (B) Identification of proteins that form stable complexes with PCGF6 in ESCs. Elutions from the PCGF6 affinity purification were directly analyzed by tryptic digestion followed by peptide identification by LC-MS/MS. The Mascot scores and peptide coverage are shown for the respective affinity purifications. (C) Confirmation of PCGF6-containing complexes by immunoprecipitation-immunoblot (IP-IB) analysis. Whole-cell extracts (WCE) from ESCs expressing FLAG-tagged PCGF6 or RINGB were subjected to IP using anti-FLAG antibody. The WCE and immunoprecipitates were separated on SDS-PAGE and analyzed by IB with the indicated antibodies. (D) Screenshot views for the distribution of PCGF6 (red) and RING1B (blue) at target genes in ESCs determined by ChIP-seq. The chromosomal positions are indicated on the x-axis. The transcription start sites (TSSs) are denoted by arrows. (E) Venn diagram representation for the overlap of PCGF6, RING1B and H3K27me3 target genes in ESCs identified by ChIP-seq. The number of genes bound by PCGF6, RING1B and H3K27me3 and included in each fraction are indicated. (F) Venn diagram representing the overlap of PCGF6, RING1B and CBX7 target genes. Published ChIP-seq data for CBX7 was obtained from NCBI GEO (accession number GSM1041373). (G) A heat map view for distribution of PCGF6, RING1B, CBX7, MAX, KDM2B and H3K27me3 in ±4 kb genomic regions around transcription start sites (TSS). Genes are classified based on their occupancy by PCGF6, RING1B and CBX7 in ESCs. The signal from a negative control (NC: FLAG-ChIP in mock transfected ESCs) was also shown. We went on to confirm these results by immunoprecipitation followed by immunoblotting (IP-IB). For this purpose, we stably expressed FLAG-tagged PCGF6 in Pcgf6-deficient (Pcgf6-KO) ESCs (Figure 1—figure supplement 1A,B) or FLAG-RING1B in wildtype (WT) ESCs (Figure 1C). We observed exogenous FLAG-PCGF6 expressed at the similar level of endogenous PCGF6. We then tested the interaction of these tagged proteins with endogenous RING1B, RYBP, L3MBTL2 and MAX (Figure 1C). We indeed found considerable association of MAX with both FLAG-PCGF6 and FLAG-RING1B as well as the other three proteins. We further observed PCGF1 or PCGF2 was not co-IPed with FLAG-PCGF6 while both of them associated with FLAG-RING1B. We finally confirmed EZH2 or SET1 were not co-IPed with either FLAG-PCGF6 or FLAG-RING1B. These results suggested that PCGF6 would be primarily involved in non-canonical PRC1 (ncPRC1), particularly PCGF6-PRC1, in mouse ESCs. The catalytic activity of both canonical PRC1 (cPRC1) and ncPRC1 is mediated by RING1A and RING1B (Buchwald et al., 2006; Gearhart et al., 2006; Trojer et al., 2011; Wang et al., 2004). Consistent with this model, it has been shown that genetic ablation of Ring1A/B leads to widespread disruption of PRC1-dependent gene repression (de Napoles et al., 2004; Endoh et al., 2008; Leeb and Wutz, 2007; Wang et al., 2004). To determine whether PCGF6 plays a role in gene repression in association with RING1B, we examined the overlap between PCGF6- and RING1B-bound sites by PCGF6 ChIP-seq (chromatin immunoprecipitation followed by deep sequencing), by using a FLAG-PCGF6 expressing Pcgf6-KO ESCs. Our results considerably overlapped with those reported recently (Figure 1—figure supplement 1C) (Yang et al., 2016). This analysis revealed that PCGF6 bound to the transcriptional start sites (TSSs) of a group of genes associated with germ cell specific functions, such as Tex19.1 (testis-expressed protein 19A) and Tdrkh (Tudor and KH domain containing) (Figure 1D). Indeed, these genes were also marked by RING1B, indicating that PCGF6 and RING1B share common targets. Intriguingly, cPRC1 targets, such as the Hoxd (homeobox protein Hox-D) gene cluster, were not bound by PCGF6 (Figure 1D), indicating that PCGF6 might associate with a subset of RING1B-bound genes that are not marked by cPRC1. A detailed examination of ChIP-seq datasets revealed that 1218, 2959 and 4946 genes in ESCs were bound by PCGF6, RING1B, and H3K27me3, respectively (Figure 1E). As expected, PCGF6-bound genes partially but significantly overlapped with both RING1B and H3K27me3 target genes (Figure 1E,F). These observations were further validated by ChIP-qPCR analysis (Figure 1—figure supplement 1D). To clarify whether PCGF6 marked loci represented cPRC1 or ncPRC1 target genes, we compared the list of PCGF6- and CBX7 (Chromobox Homolog 7)-bound genes. As CBX7 is a key component of cPRC1 (Bernstein et al., 2006; Morey et al., 2013), exclusion of PCGF6-bound sites from CBX7-bound sites would indicate an ncPRC1-centric role for PCGF6, while an overlap would indicate the opposite. CBX7-bound genes were mostly co-occupied by RING1B, as expected (Figure 1F). PCGF6 target sites, however, exhibited only a limited overlap with CBX7, supporting the model in which PCGF6 is predominantly involved in ncPRC1. To gain insight into the binding profile of PCGF6 at target genes, we plotted PCGF6, RING1B, CBX7, MAX, KDM2B and H3K27me3 ChIP-seq reads in a ±4 kb region surrounding TSS (Figure 1G). This analysis revealed that PCGF6 bound in close proximity to TSS, unlike RING1B, CBX7 and H3K27me3, all of which exhibited a broader distribution (Figure 1G). We observed considerable association of MAX at PCGF6 targets irrespective of RING1B binding. In contrast, H3K27me3 deposition at PCGF6 targets was mainly seen at RING1B-bound genes. We also noted that PCGF6 target genes harbor CGIs that tend to be slightly shorter and more methylated than CBX7 targets (Figure 1—figure supplement 1E). Consistently, PCGF6 targets were bound by KDM2B. KDM2B loss induced a subtle increase of RING1B binding at PCGF6 targets while RING1B binding at CBX7 targets was marginally decreased (Figure 1—figure supplement 1F). Moreover, PCGF6-bound genes were up-regulated to a much lesser extent than CBX7-bound genes in Kdm2b-KO ESCs (Figure 1—figure supplement 1G). These results suggest that the CGI recognition by KDM2B has distinct roles for PCGF6-PRC1 recruitment from that reported for cPRC1 (Farcas et al., 2012). We next wondered whether PCGF6 binding was functionally required for transcriptional repression. To test this, we performed RNA-seq and found that more than 250 genes were considerably up-regulated in Pcgf6-KO ESCs (Figure 2—figure supplement 1A). Importantly, these genes were a subset of the genes up-regulated in the Ring1A and Ring1B double knockout (Ring1A/B-dKO) ESCs (Figure 2—figure supplement 1A). To gain insight into the association of PCGF6 and RING1B for gene regulation, we divided RING1B- or PCGF6-bound genes into three categories (PCGF6+RING1B+, PCGF6-RING1B+ and PCGF6+RING1B-) and examined their expression in WT ESCs using FPKM (fragments per kilobase of exon per million mapped sequence reads) values (Figure 2—figure supplement 1B). This analysis showed that the PCGF6+RING1B+ genes were barely transcribed in WT ESCs; likewise, the PCGF6-RING1B+ genes were marginally expressed. In contrast, the PCGF6+RING1B- group that harbors CGIs was robustly expressed. We went on to examine changes of respective gene expression levels in each category in the absence of Pcgf6 (Pcgf6-KO) (Figure 2A, left). We found both PCGF6+RING1B+ and PCGF6-RING1B+ genes were significantly up-regulated while expression levels of PCGF6+RING1B- or PCGF6-RING1B- genes were barely altered in Pcgf6-KO ESCs (Figure 2A, left). We however also found that expression levels of highly up-regulated genes (more than 5-times; indicated by red lines in Figure 2A) in the PCGF6+RING1B+ category were considerably higher than those in the PCGF6-RING1B+ category in Pcgf6-KO ESCs. Those categories were also up-regulated in Ring1A/B-dKO ESCs (Figure 2A, right), suggesting a functional link between PCGF6 and RING1A/B for down-regulation of such genes. We further confirmed these changes in expression levels of selected PCGF6+RING1B+ and PCGF6-RING1B+ genes by RT-qPCR in Pcgf6-KO and Ring1A/B-dKO ESCs (Figure 2—figure supplement 1B,C). Together, PCGF6 is suggested to contribute to RING1B-mediated repression of target genes primarily in the PCGF6+RING1B+ category but also in RING1B targets not bound by PCGF6 to a lesser extent. We thus suggest PCGF6+RING1B+ category as a primary target for PCGF6-PRC1-mediated gene repression. RING1B-dependent repression of target genes by PCGF6-PRC1. (A) Dot plot representation for gene expression changes in Pcgf6-KO (left) and Ring1A/B-dKO (right) ESCs. Expression levels of respective genes (FPKM: determined by RNA-seq) in each group (classified by ChIP-seq) in control (Ctrl) and respective knockouts (KO) are shown by grey and yellow dots, respectively. The median of FPKM in each group is indicated by a green horizontal line. Genes whose expression (FPKM) changed more than 5-fold were indicated by red (up-regulated in KO) or blue (down-regulated in KO) lines. Genes silenced in Ctrl but active in KO are indicated by orange lines, while genes vice versa are indicated by light blue lines. The number of genes included in each subset is shown at the bottom. p-values for the difference of expression changes between Ctrl and KO were calculated by the Student’s t-test and are indicated above each graph. (B) RT-qPCR-based validation for expression changes of selected genes in Pcgf6-KO ESCs. Expression levels of genes required for pluripotency, or bound by PCGF6-PRC1 or canonical PRC1 (underlined) in Pcgf6fl/fl;Rosa26::CreERT2tg/+ ESCs before (WT) or after OHT treatment (day 4 and 8). Expression levels were normalized to a Gapdh control and are depicted as fold change relative to OHT-untreated (WT) ESCs. Error bars represent standard deviation determined from at least three independent experiments. (C) Changes in local H2AK119ub1 and H3K27me3 deposition at selected PCGF6-PRC1 target genes in Pcgf6-KO ESCs. Local levels of H2AK119ub1 and H3K27me3 at promoter regions of genes bound by PCGF6-PRC1 or canonical PRC1 (underlined) in Pcgf6fl/fl;Rosa26::CreERT2tg/+ ESCs before (WT) or after (day 4 and 8) OHT treatment were determined by ChIP-qPCR analysis. The relative amount of ChIPed DNA is depicted as a percentage of input DNA. Error bars represent standard deviation determined from at least three independent experiments. (D) Requirement of RING1B catalytic activity for repression of genes bound by PCGF6-PRC1. Expression levels of the indicated genes in mock-transfected Ring1A−/−;Ring1Bfl/fl;Rosa26::CreERT2tg/+ ESCs before (Ring1A−/−) and 2 day after OHT treatment (Ring1A/B-dKO) and in those stably expressing wild type (WT) or catalytically-dead (I53S, I53A) Ring1B. 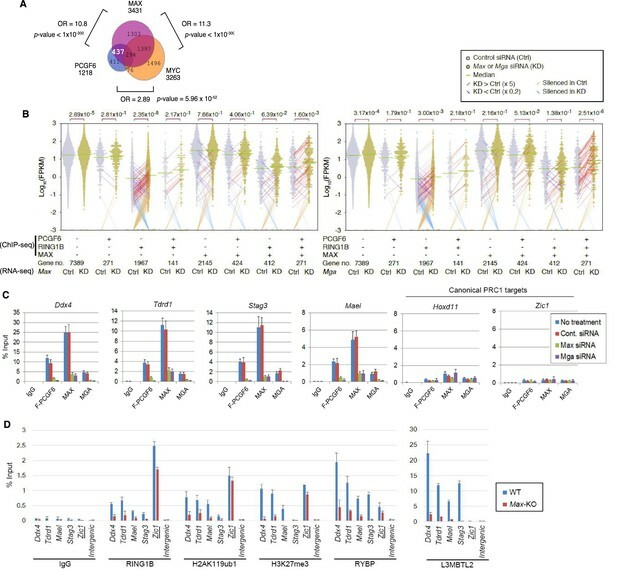 Expression levels were normalized to a Gapdh control and are depicted as fold change relative to OHT-untreated mock-transfected parental ESCs (Ring1A−/−). Those in wild-type ESCs (WT) are also shown. Error bars represent standard deviation determined from at least three independent experiments. To gain insight into the physiological role of PCGF6-PRC1-mediated gene regulation in ESCs, we performed gene ontology (GO) analyses, which revealed that PCGF6-PRC1 target genes are enriched in meiosis- and germ cell-related genes as suggested previously (Zdzieblo et al., 2014), unlike the cPRC1 target genes that are predominantly enriched in developmental genes (Figure 2—figure supplement 1D). These results suggest a potential role of PCGF6-PRC1 for suppression of the meiotic program or germ cell differentiation program, or both, in ESCs. The RING1A/B proteins play a key role for transcriptional repression by mediating H2AK119ub1 (Endoh et al., 2012; Wang et al., 2004). We therefore investigated whether PCGF6-PRC1-mediated gene regulation involves H2AK119ub1. Indeed, ChIP-qPCR analyses revealed considerable enrichment of H2AK119ub1 at PCGF6-PRC1 target genes (Figure 2C). Furthermore, this H2AK119ub1 enrichment was dramatically diminished in the absence of Pcgf6, revealing a role for PCGF6 in mediating H2AK119ub1 deposition (Figure 2C). In contrast, H2AK119ub1 enrichment at Zic1 and Hoxd11, cPRC1 targets, was marginally affected in Pcgf6-KO ESCs, further supporting our model that PCGF6 is not primarily involved in cPRC1-dependent repression (Figure 2C, middle). To gain insight into the functional involvement of PCGF6-mediated H2AK119ub1 in repression of the target genes, we next examined the effect of loss of RING1B catalytic activity on expression of these genes (Figure 2D). Previous reports have demonstrated that mutations of RING1B residue I53 (i.e., I53S or I53A), abrogated its E3 ligase activity by disrupting its interactions with the E2 ubiquitin-conjugating enzyme UBCH5C (also known as UBE2D3: Ubiquitin-conjugating enzyme E2 D3) (Ben-Saadon et al., 2006; Buchwald et al., 2006; Endoh et al., 2012; Eskeland et al., 2010). Rescuing the Ring1A/B-dKO cells with the I53 mutants failed to maintain transcriptional repression, demonstrating that repression of PCGF6 target genes depends on the catalytic activity of RING1B and likely also downstream H2AK119ub1 deposition (Figure 2D). Since our previous report demonstrated that H2AK119ub1 plays a critical role for recruitment of PRC2 and downstream H3K27me3 deposition (Blackledge et al., 2014), we thus investigated H3K27me3 deposition at the representative PCGF6 bound genes, and indeed found a significant H3K27me3 enrichment at these targets (Figure 2—figure supplement 1E). As expected, the H3K27me3 level was markedly reduced in the absence of the key PRC2 component EED (embryonic ectoderm development), confirming that H3K27me3 deposition in these genes is mediated by the PRC2 complex (Figure 2—figure supplement 1E). We indeed found a considerable reduction in H3K27me3 level at these PCGF6-PRC1 targets in Pcgf6-KO ESCs, but only marginally at cPRC1 targets, suggesting a potential role for PCGF6-mediated H2AK119ub1 to recruit PRC2 (Figure 2C). However, consistent with a previous report (Riising et al., 2014), PRC2-mediated mechanisms exhibited only limited impact on the repression of PCGF6-PRC1 targets (Figure 2—figure supplement 1F). Previous studies have reported that PCGF6 interacts with RING1B through its RING finger domain (Akasaka et al., 2002). Given that PCGF6 loss led to a marked reduction in H2AK119ub1 deposition specifically at PCGF6-PRC1 target genes (Figure 2C), we wondered whether PCGF6 is directly involved in recruitment of RING1B and its catalytic activity. To test this model, we expressed a PCGF6 protein fused to the TET repressor (PCGF6/TETR), and ectopically tethered this fusion protein to a pre-integrated TetO array in ESCs (Figure 3A), taking advantage of an experimental system that we have previously described (Blackledge et al., 2014). ChIP-qPCR analysis showed binding of the PCGF6/TETR fusion protein at the TetO array. Importantly, this was accompanied by considerable enrichment of RING1B, MAX and H2AK119ub1, indicating that PCGF6 recruits PCGF6-PRC1 (Figure 3A). We also observed association of EZH2 and H3K27me3 with the TetO array, likely mediated by the upstream H2AK119ub1 as reported previously (Blackledge et al., 2014). The role of PCGF6 in recruiting PCGF6-PRC1 to its target genes. (A) Forced tethering of PCGF6 to a TetO array induced activation of PCGF6-PRC1 recruitment. A schematic illustrating the de novo targeting of the TetR-PCGF6 fusion protein to the TetO sequences (left). ChIP analysis for TetR, RING1B, EZH2, MAX, H2AK119ub1, H3K27me3 and H3 across the TetO-containing locus in ESCs revealed TetR-PCGF6-mediated local activation of the PCGF6-PRC1 pathway (bottom). ChIP experiments were performed at least in biological duplicate with error bars showing SEM. (B) Screenshot views of the RING1B distribution at selected target genes in wild type (WT) and Pcgf6-KO ESCs. RING1B distribution in Pcgf6fl/fl;Rosa26::CreERT2tg/+ ESCs before (WT; red) or 4 days after OHT treatment (Pcgf6-KO; blue) revealed by ChIP-seq is shown. The chromosome numbers and locations are indicated on the x-axis. The transcription start sites (TSSs) are denoted by arrows. (C) A heat map view of RING1B distribution in ±4 kb genomic regions around TSS in wild type (WT; brown), Pcgf6-KO (green), Mel18/Bmi1-dKO (blue) and Ring1A/B-dKO (gray) ESCs. RING1B-bound genes are further subclassified by binding of PCGF6 and CBX7 (left). Average distribution and p-value for its change in respective KO are also shown (right). (D) PCGF6-mediated RING1B recruitment to its target via a direct molecular interaction. Local levels of Flag-tagged PCGF6, RING1B, H2AK119ub1 and H3K27me3 at Ddx4 and Mael promoters in mock-transfected Pcgf6fl/fl;Rosa26::CreERT2tg/+ ESCs before (WT) and after OHT treatment (Pcgf6-KO) and in ESCs stably expressing WT [Pcgf6-KO_F-Pcgf6(WT)] or H155Y Pcgf6 [Pcgf6-KO_F-Pcgf6(HY)] constructs were determined by ChIP-qPCR. The relative amount of ChIPed DNA is depicted as a percentage of input DNA. Error bars represent standard deviation determined from at least three independent experiments. (E) PCGF6 is dispensable for local L3MBTL2 binding to target genes. Local levels of L3MBTL2 at the promoter regions of the indicated genes in Pcgf6fl/fl;Rosa26::CreERT2tg/+ ESCs before (WT) or 4 days after OHT treatment (Pcgf6-KO) were determined by ChIP-qPCR. Underlined genes are canonical PRC1 targets. To confirm these in vitro findings in vivo, we performed RING1B ChIP-seq in WT and Pcgf6-KO ESCs. This experiment demonstrated that RING1B binding to PCGF6-PRC1 target genes such as Tex19.1, Tdrkh, Syce1 (synaptonemal complex central element protein 1) and Mael (maelstrom spermatogenic transposon silencer) was indeed considerably depleted in the absence of Pcgf6 (Figure 3B). In contrast, RING1B binding to cPRC1 target sites, such as the Hoxb cluster, was unaffected. To determine the role of PCGF6 in RING1B recruitment at ncPRC1 targets in a comprehensive manner, we divided RING1B-bound genes into four categories (Figure 3C). The first category consisted of genes bound by RING1B but not PCGF6 or CBX7 (PCGF6-CBX7-RING1B+). Genes in the second category were bound by both PCGF6 and RING1B, but not CBX7 (PCGF6+CBX7-RING1B+); and therefore represented the core targets of the non-canonical PCGF6-PRC1 complex. The third category consisted of the cPRC1 target genes, which were bound by CBX7 and RING1B, but not PCGF6 (PCGF6-CBX7+RING1B+). Finally, the fourth category was marked by all three factors (PCGF6+CBX7+RING1B+). We observed considerable reduction of RING1B binding to the core PCGF6-PRC1 target genes (PCGF6+CBX7-RING1B+) in Pcgf6-KO (green dot plots in Figure 3C, left; green lines in Figure 3C, right). In contrast, cPRC1 target genes (PCGF6-CBX7+RING1B+) were not affected. Consistent with these observations, genetic ablation of Pcgf2 (Mel18) and Pcgf4 (Bmi1), both of which are essential components of the cPRC1 complex, led to reduction of RING1B binding of only cPRC1 target genes (PCGF6-CBX7+RING1B+) (blue dot plots in Figure 3C, left; blue lines in Figure 3C, right). These observations were further confirmed by ChIP-qPCR for selected target genes (Figure 3—figure supplement 1A). Taken together, these findings indicate that PCGF6 preferentially recruits RING1B to PCGF6-PRC1 targets, but not to cPRC1 targets. To determine whether PCGF6-dependent RING1B recruitment involved direct physical interactions between these two proteins, we tested a PCGF6 mutant with an amino acid substitution (H155Y) in a conserved residue critical for interaction with RING1B (Buchwald et al., 2006). We expressed the mutant in Pcgf6-KO ESCs, and noted that it indeed failed to interact with RING1B, while retaining the ability to associate with L3MBTL2 and MAX (Figure 3—figure supplement 1B). ChIP-qPCR analysis showed that although the mutant PCGF6 could bind the indicated target genes, it failed to recruit RING1B (Figure 3D) and, as a result, H2AK119ub1 and H3K27me3 marks were also not established in the target genes. Consistent with this interpretation, the mutant PCGF6 failed to repress PCGF6-PRC1 targets genes (Figure 3—figure supplement 1C). Based on these observations, we concluded that PCGF6 contributes to the assembly and recruitment of the PCGF6-PRC1 complex by direct physical interactions with RING1B, which likely plays a critical role to mediate the repression. Previous and these studies, however, suggest potential involvement of other mechanisms, such as L3MBTL2, G9A/GLP and CBX1/3 for the repression by PCGF6-PRC1 (Maeda et al., 2013; Qin et al., 2012; Trojer et al., 2011). Indeed, we noted that PCGF6 was dispensable for L3MBTL2 binding of gene promoters (Figure 3E). As L3MBTL2 has been reported as a recruiter of ncPRC1 (Qin et al., 2012; Trojer et al., 2011), this observation suggests that PCGF6 and L3MBTL2 may function in parallel to recruit ncPRC1 complexes. We went on to examine contribution of H3K9me2, which is mediated by G9A/GLP, for PCGF6-PRC1-target repression (Figure 3—figure supplement 1D). Unlike L3mbtl2-KO ESCs (Qin et al., 2012), we did not observe considerable changes in H3K9me2 levels in Pcgf6-KO. Together, we suggest that the L3MBTL2/G9A axis is marginally involved in PCGF6-mediated repression. We further investigated the role of CBX1/3 for the regulation of PCGF6-PRC1 targets by using tamoxifen-inducible Cbx1 and Cbx3 double knockout (Cbx1/3-dKO) ESCs (Figure 3—figure supplement 1E). We did not observe a significant change in the expression levels of PCGF6+CBX7-RING1B+ in Cbx1/3-dKO ESCs, suggesting that CBX1/3 have, if any, a marginal role for the repression of PCGF6-PRC1 targets in ESCs (Figure 3—figure supplement 1F). The above results establish a role for PCGF6 in the recruitment of RING1B, however, the mechanism by which PCGF6-PRC1 is targeted to such loci is not understood. According to the canonical model, H3K27me3 facilitates PRC1 binding via direct recruitment of CBX proteins (Bernstein et al., 2006; Cao et al., 2002; Czermin et al., 2002; Fischle et al., 2003; Kuzmichev et al., 2002); we therefore examined whether H3K27me3 plays a role in PCGF6 recruitment (Figure 4—figure supplement 1A,B). For this purpose, we stably expressed a FLAG-tagged PCGF6 in WT or Eed-KO ESCs (deficient for H3K27me3), and compared PCGF6-binding levels at target genes. We did not observe any significant differences in FLAG-PCGF6 binding between WT and Eed-KO cells (Figure 4—figure supplement 1B), suggesting that H3K27me3 is dispensable for locus-specific recruitment of PCGF6-PRC1. Consistently, H2AK119ub1 levels at genes bound by PCGF6 were not affected in the Eed-KO (Figure 4—figure supplement 1C). In contrast, PCGF2, a component of cPRC1, barely associates with PCGF6 targets irrespective of H3K27me3 status, while it strongly associates with cPRC1 targets such as Zic1 and Hoxb3 in an EED-dependent manner (Figure 4—figure supplement 1C). 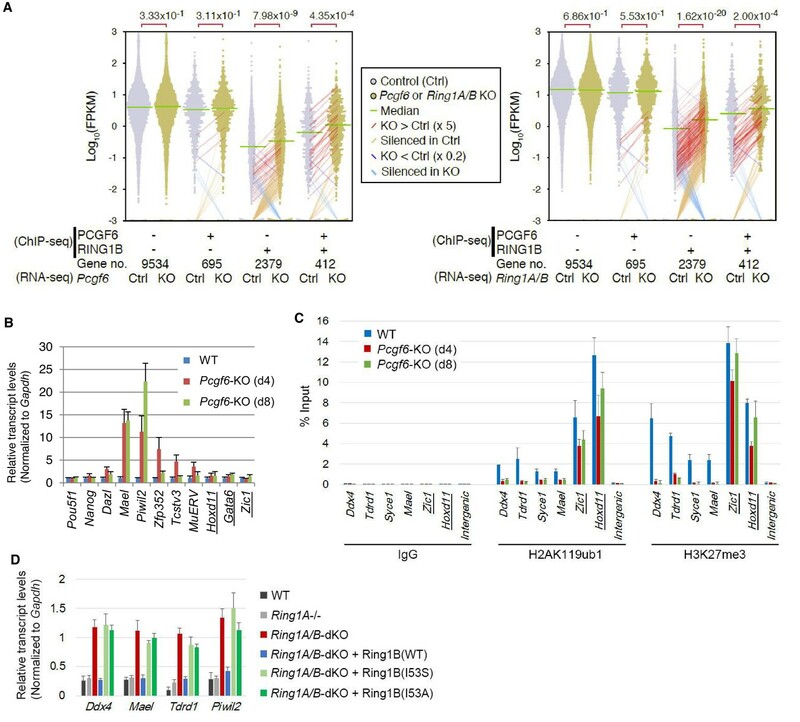 These findings suggests that the H3K27me3-dependent pathway to recruit cPRC1 is barely active at PCGF6-PRC1 targets. To determine the molecular mechanism that mediates recruitment of PCGF6-PRC1 to target loci, we surveyed the DNA sequences of PCGF6-bound promoters to extract potential transcription factor binding motifs. We observed enrichment of the E-box motif CACGTG, a DNA sequence that is recognized by the bHLH-containing transcription factors including MAX (Blackwood and Eisenman, 1991), within these promoters (Figure 4—figure supplement 1D). Importantly, this motif was not enriched in RING1B- or CBX7-bound genes (Figure 4—figure supplement 1D), suggesting that the E-box motif is a feature of PCGF6-PRC1 targets. Consistent with this notion, we observed considerable overlap between PCGF6-bound and MAX-bound genes, while the overlap between PCGF6-bound and MYC-bound genes was much less (Figure 4A). Interestingly, MGA, a transcription factor that also forms a heterodimer with MAX and binds the CACGTG E-box motif (Hurlin et al., 1999), is included in the PCGF6 complex determined by us (Figure 1B) and others (Gao et al., 2012; Hauri et al., 2016; Kloet et al., 2016; Ogawa et al., 2002; Qin et al., 2012; Trojer et al., 2011). Therefore, we hypothesized that MAX/MGA heterodimer could play a role in PCGF6-PRC1 recruitment. The role of MAX/MGA in recruiting PCGF6-PRC1 to its target genes. (A) Considerable overlap of genes bound by PCGF6 and MAX. Venn diagram depicts the overlap of PCGF6, MAX and MYC target genes in ESCs. Published ChIP-seq data for MAX and MYC were obtained from NCBI GEO (accession number GSM1171650 and GSM1171648, respectively). Odds ratio (OR) and p-values for the overlap between respective groups are indicated. Numbers represent the number of genes bound by each protein or included in each fraction seen in the Venn diagram. (B) Dot plot representation for gene expression changes in Max-KD (left) and Mga-KD (right) ESCs. Expression levels of respective genes (FPKM: determined by RNA-seq) in each group (classified by ChIP-seq) in control (Ctrl) and respective knockdowns (KD) are shown by grey and yellow dots, respectively. The same codes as described in Figure 2A are used. (C) Changes in binding of FLAG-tagged PCGF6, MAX and MGA at the selected targets induced by knockdown of Max or Mga. Local levels of FLAG-tagged PCGF6, MAX and MGA at the respective promoter regions in untreated ESCs or ESCs treated with either control siRNA, Max siRNA or Mga siRNA were determined by ChIP-qPCR. The relative amount of ChIPed DNA is depicted as a percentage of input DNA. Error bars represent standard deviation determined from at least three independent experiments. (D) Changes in local deposition of RING1B, H2AK119ub1, H3K27me3, RYBP and L3MBTL2 at the indicated targets in Max-KO ESCs. Underlined genes are canonical PRC1 targets. Their deposition in Max conditional KO ESCs before (WT) or after doxycycline treatment (Max-KO) was determined by ChIP-qPCR. The relative amount of ChIPed DNA is depicted as a percentage of input DNA. Error bars represent standard deviation determined from at least three independent experiments. To examine this possibility, we depleted MAX or MGA by siRNA-mediated knockdown (KD) in FLAG-PCGF6 expressing ESCs. The Max or Mga mRNA levels were reduced to less than 20% of control by their respective siRNAs (Figure 4—figure supplement 1E, top). Western blot analysis revealed that MAX protein was undetectable in the Max-KD ESCs, while the expression of FLAG-PCGF6 and RING1B was unchanged (Figure 4—figure supplement 1E, bottom). To determine the impact of MAX or MGA depletion, we performed RNA-seq in Max-KD or Mga-KD ESCs. Interestingly, genes that were bound by MAX, PCGF6 and RING1B (MAX+PCGF6+RING1B+) showed significant up-regulation in Max-KD or Mga-KD ESCs (Figure 4B). We performed locus-specific RT-qPCR assays in the Ddx4 [DEAD (Asp-Glu-Ala-Asp) box polypeptide 4], Tdrd1 (Tudor domain containing 1), Stag3 (stromal antigen 3) and Mael loci, and confirmed our RNA-seq results (Figure 4—figure supplement 1F). In contrast, genes bound by PCGF6 and RING1B, but not MAX (MAX-PCGF6+RING1B+), were barely up-regulated (Figure 4B). Intriguingly, we observed significant up-regulation of genes bound only by RING1B (MAX-PCGF6-RING1B+). We however also noted that the expression level of up-regulated genes in this category was considerably lower compared to MAX+PCGF6+RING1B+ genes (Figure 4B). We thus suggest MAX and MGA primarily contribute to the repression of MAX+PCGF6+RING1B+ genes. GO analysis revealed that genes bound by PCGF6, RING1B and MAX but not by MYC (PCGF6+RING1B+MAX+MYC-), were significantly enriched in germ cell- and meiosis-related functions (Figure 4—figure supplement 1G), further supporting our model that PCGF6-PRC1 functions as a dedicated repressor of genes associated with germ cells and meiosis. We investigated whether binding of PCGF6-PRC1 to gene promoters required MAX and its cofactor MGA. Indeed, ChIP-qPCR in the Max-KD or Mga-KD ESCs revealed that PCGF6 binding to target loci depends on MAX and MGA (Figure 4C). Importantly, MAX and MGA bind these targets in mutually dependent manner (Figure 4C). This suggests that MAX and MGA may form a dimer to bind to their targets. We further used a previously reported Max-KO ES cell line to test MAX-dependent recruitment of PCGF6-PRC1 (Hishida et al., 2011). RING1B and RYBP, which form stoichiometric complexes with PCGF6 (Figure 1B), did not bind to PCGF6-PRC1 target loci in the Max-KO ESCs (Figure 4D). Likewise, local H2AK119ub1 and H3K27me3 levels were considerably decreased, and binding of L3MBTL2, another key regulator of ncPRC1, into PCGF6-PRC1 target genes was also depleted in the Max-KO ESCs (Figure 4D). In contrast, enrichment of RING1B, H2AK119ub1, H3K27me3 and RYBP at Zic1, a cPRC1 target, did not show considerable changes in the Max-KO ESCs. These results suggest that recruitment of both PCGF6 and L3MBTL2 requires MAX. We finally checked whether the decreased binding of PCGF6 is not due to secondary effects of transcriptional activation upon MAX depletion. We have selected genes bound by MAX and PCGF6, which were not up-regulated in Max-KO ESCs, and confirmed MAX-dependent binding of PCGF6 at these targets (Figure 4—figure supplement 1H). Collectively, these findings indicate that the MAX/MGA heterodimer recruits PCGF6-PRC1 to its targets. A role for MAX in maintaining ESC proliferation and self-renewal ability has been reported in a previous study (Hishida et al., 2011). We also observed that conditional deletion of Max (Max-KO) led to slower ESC proliferation and cell differentiation (Figure 4—figure supplement 2A, right). Rescuing the induced Max-KO cells with an exogenous WT MAX restored cell proliferation and blocked spontaneous differentiation, as expected. In contrast, mutant MAX proteins harboring defects in the basic region of the bHLH (basic helix-loop-helix) domain [hereafter referred to as MAX(VD) or MAX(Δb)] (Figure 4—figure supplement 2A, left), failed to do so (Figure 5A, right). These findings indicate that DNA motif recognition by MAX plays a role in maintaining ESCs, at least partly by recruiting the PCGF6-PRC1 complex. A role for PCGF6 in maintaining ESCs in an undifferentiated state. (A) Colony morphology of Pcgf6-KO ESCs in the presence of fetal bovine serum (FBS) and 3i. Phase-contrast views of OHT-untreated and –treated (day six) Pcgf6fl/fl;Rosa26::CreERT2tg/+ ESCs are shown. Scale bars indicate 200 µm. (B) Decreased growth rate of Pcgf6-KO ESCs. Proliferation of OHT-untreated or -treated Pcgf6fl/fl;Rosa26::CreERT2tg/+ ESCs in the presence of FBS and 3i is shown. (C) A schematic representation of the in vitro differentiation scheme for Pcgf6fl/fl;Rosa26::CreERT2tg/+ ESCs towards EpiLCs and PGCLCs is shown. OHT was added to deplete Pcgf6 at the indicated time points (closed arrowheads with ‘OHT’). Cells used for RNA-seq analysis were collected at the time points indicated as ‘Sampling’. (D) PCGF6 is indispensable to maintain proliferation of ESCs in serum-free condition. Phase contrast views of Pcgf6-KO [TAM(+); at two days after OHT treatment] and the control [TAM(−)] (left). Growth rates of OHT-treated (yellow) and –untreated (green) cells (right). (E) PCGF6 is indispensable to maintain proliferation of epiLCs. Phase contrast views of Pcgf6-KO [TAM(+); at 2 days after OHT treatment] and the control [TAM(−)] (left). Growth rates of OHT-treated (yellow) and –untreated (green) cells (right). (F) PCGF6 is dispensable for differentiation of post-epiLCs towards PGCLC. OHT-treatment considerably expanded the SSEA1+CD61+ fraction. (G) Gene expression changes upon induced deletion of Pcgf6. Pcgf6fl/fl;Rosa26::CreERT2tg/+ ESCs (red), EpiLCs (blue), and PGCLCs (green) induced upon depletion of Pcgf6 by OHT treatment for each subset of total genes (left) or meiosis-related genes (right) classified by the presence (+) or absence (−) of PCGF6- and RING1B-binding in ESCs. The average, deviation and distribution of the expression changes for the respective subsets of genes determined by RNA-seq analysis are shown. The box plots represent the median (horizontal line), interquartile range (box), range (whiskers), and outliers (circles). The number of genes included in each subset is shown at the bottom. p-values for average gene expression change in each subset upon Pcgf6 depletion were calculated by the Student’s t-test and are indicated at the top. Mechanistically, co-IP analyses showed that a FLAG-tagged MAX protein physically interacts with HA-PCGF6, RING1B and L3MBTL2. The mutant MAX proteins also retained the ability to associate and form stable complexes with HA-PCGF6, RING1B and L3MBTL2 (Figure 4—figure supplement 2B). As expected, ChIP-qPCR revealed that the FLAG-tagged MAX could restore binding of the HA-tagged PCGF6 into target loci in Max-KO ESCs (Figure 4—figure supplement 2C,D), whereas the mutant MAX proteins failed to bind targets and recruit HA-tagged PCGF6. These observations demonstrate a role of the MAX/MGA heterodimer in recruiting PCGF6-PRC1 by direct DNA motif recognition for maintenance of ESCs. To further examine this model, we expressed MAX/TETR, and ectopically tethered this fusion protein to a pre-integrated TetO array in ESCs (Figure 4—figure supplement 2E). ChIP-qPCR analysis showed binding of the MAX/TETR fusion protein at the TetO array, which was accompanied by mild enrichment of HA-tagged PCGF6, H2AK119ub1 and H3K27me3 (Figure 4—figure supplement 2E), but barely RING1B (data not shown). These data again support MAX-dependent recruitment of PCGF6-PRC1. The limited effect of MAX/TETR to recruit PCGF6 could be due to a potential dimerization of MAX with other partners than MGA in this experimental setup. Given that MAX and PCGF6 interact with each other, and that genetic ablation of Max causes reduced cell growth and germ cell-directed differentiation of ESCs (Hishida et al., 2011; Suzuki et al., 2016), we wondered whether knocking out Pcgf6 would also lead to similar phenotypes. Indeed, the growth rate of Pcgf6-KO ESCs was significantly slower than the WT in the presence of three inhibitors (3i: SU5402 for FGFR, PD184352 for ERK, and CHIR99021 for GSK3) and fetal bovine serum as suggested previously (Zdzieblo et al., 2014) (Figure 5A,B). The growth of Pcgf6-KO ESCs was further halted under serum-free condition (Figure 5D). Unlike the Max-KO, however, Pcgf6-KO ESCs maintained an ESC-like morphology. These findings support the notion that PCGF6-PRC1 has a role in ESC proliferation, but may not be essential to maintain ES cell morphology. Genetic ablation of Pcgf6 leads to ectopic expression of meiosis-related and germ cell-related genes in ESCs. We therefore examined the impact of Pcgf6 deletion in primordial germ cell-like cells (PGCLCs), which already express such germ cell-related genes. We induced the PGCLCs via epiblast-like cells (epiLCs), using an in vitro culture system that we have previously developed (Hayashi et al., 2011). In particular, we cultured the ESCs in 2i-containing (MAPK inhibitor and GSK3 inhibitor) media without feeders for 3 days (from day −5 to day −2 in Figure 5C), and induced epiLC by adding Activin A and bFGF into the media for 2 days (from day −2 to day 0). We further differentiated the epiLCs into the germ cell-lineage by adding BMPs, SCF, LIF, and EGF for 6 days (from day 0 to day 6). Genetic ablation of Pcgf6 at day −5 induced growth arrest and cell death of ESCs (Figure 5D); while ablation of Pcgf6 at day −2 caused significant growth defects in epiLCs (Figure 5E), revealing a stage-specific role of PCGF6 for growth and survival of ESCs and epiLCs. In contrast, OHT-treatment at day +2 (post-epiLC stage) did not induce growth arrest or cell death and, surprisingly, even accelerated differentiation and proliferation (Figure 5F). The disparate effects of Pcgf6 ablation in ESCs, epiLCs and PGCLCs raised the question of whether the PCGF6 targets in these cell types are different. We therefore performed RNA-seq before and after knocking out Pcgf6 in ESCs, epiLCs and PGCLCs (Figure 5G). We observed that the same group of genes (the PCGF6+RING1B+ category in ESCs) were de-repressed in ESCs, epiLCs and PGCLCs in the absence of Pcgf6. Furthermore, the extent of derepression of PCGF6 target genes was also similar among these three cell types. We observed similar trends for meiosis- and germ cell-related genes (Figure 6G, right). Thus, these results indicate that the different phenotypic impacts of Pcgf6 ablation in ESCs, epiLCs and PGCLCs are not due to up-regulation of different sets of genes, but rather suggest that PCGF6-PRC1-mediated gene silencing is essential to maintain ESC and epiLC, but not PGCLC. PCGF6, therefore, plays a role in maintaining pluripotency, likely by suppressing germ cell potential in ESCs. Pleiotropic effects of PCGF6 loss during development. (A) Schematic representation of the Pcgf6 locus, the targeting vector, and the constitutive mutant allele. To disrupt Pcgf6, most of the exon 2 and the entire exon 3 which code for the RING finger domain were replaced with neo. The neo and HSV-tk cassettes were used for positive and negative selection, respectively. The positions of the restriction sites (XhoI, EcoRI and KpnI), external probe and PCR primers, and sizes of diagnostic fragments are indicated. Coding regions and untranslated regions of Pcgf6 are indicated by closed and open boxes, respectively. (B) Southern (top) and PCR (bottom) analyses for genotyping. For Southern blotting, genomic DNA was digested by KpnI and probed with the 3’ probe, as indicated in A. For PCR, a mixture of three primers (p1, p2 and p3 in A) was used. (C) Northern analysis of Pcgf6 mRNA expression in wild type (+/+) and homozygous (−/−) adult kidney (top). Ethidium bromide (EtBr) staining of the same gel is shown below. (D) Genotype distribution of progeny of Pcgf6 heterozygous intercrosses. *p-value<0.05 (χ2 test), indicating a < 5% probability of conforming to the Mendelian law, which predicts a 1:2:1 ratio between +/+:+/−: −/−. (E) Delayed and/or abnormal development of Pcgf6-KO (−/−) embryos at 10.5 dpc. Wild-type (+/+) embryos are shown as controls. (F) Genotype distribution of ESC lines derived from embryos from intercrosses between Pcgf6+/+ or −/− male and +/− female is shown. Genotypes of 22 ESC lines were determined using genomic PCR. (G) Skeletal alterations in Pcgf6−/− newborn mice. (a, d) Lateral views of the cervical and thoracic regions revealed the prominent spinous process on the 9–10 in Pcgf6−/− (d, indicated by an arrow) but on the nine in the wild type (a, indicated by an arrow). (b, e) Overviews of the seventh vertebrae identified association of an anterior tubercle on seven in Pcgf6−/−, which appears on six in the wild type (e, indicated by an arrow). (c, f) Ventral views of rib cages identified an ectopic sternal rib in Pcgf6−/− (f, labeled 15). (H) Schematic representation summarizing the axial alterations in Pcgf6−/− newborn mice. Each arrow represents the following morphological changes in the vertebrae; (a) 1←2: association of the anterior arch of the atlas with the atlas; (b) 6←7: the anterior tubercle(s) on 7, which are normally on 6; (c) 8←9: fusion of rib(s) on 9 to 8; (d) 9←10: the prominent spinous process on 10, which is normally on 9; (e) 14←15: fusion of ribs on 15 to the sternum. (I) Changes in Hoxb6 expression in Pcgf6-KO mice. Hoxb6 expression in 11.5-dpc wild-type (a) and Pcgf6−/− (c) embryos. Segment boundaries are indicated by red lines and segment numbers of anterior expression domains of Hoxb6 are shown. Bright field views are shown in (b, d). (J) HE sections of 11.5 dpc wild type (+/+) and Pcgf6-deficient (−/−) placentae. Al: allantois, Ch: chorion, La: labyrinth layer, asterisks: enucleated erythrocytes from the mother, arrows: fetus-derived nucleated erythrocytes. Note that fetus-derived nucleated erythrocytes are observed in well-developed labyrinth layer in Wild-type mice but not in Pcgf6-KO mice. Expression of trophoblast lineage-restricted markers was analyzed by RNA in situ hybridization. Pl1 identifies trophoblast giant cells. Tpbp identifies spongiotrophoblasts. (K) Quantification of placental area from 10.5 dpc HE sections of wild type (+/+), Pcgf6 heterozygote (+/−) and Pcgf6-deficient (−/−) embryos. As PCGF6 plays a role in pluripotency and suppression of germ cell-specific genes in ESCs, we wondered whether PCGF6 possessed similar functions in vivo during mouse embryogenesis. Consistently, Pcgf6 is expressed in broad range of tissues and cell types and even abundantly in testis, ESCs and pre-implantation embryos (Figure 6—figure supplement 1A,B). To examine this possibility, we used a constitutive mutant Pcgf6 allele (Figure 6A,B,C). We found that Pcgf6-KO (−/−) mice were viable and fertile, but were not born at the normal Mendelian ratio (Figure 6D). Lethality among Pcgf6−/− homozygous embryos could be observed as early as the blastocyst stage [3.5 days post coitum (dpc)]. Furthermore, embryonic death in the Pcgf6−/− line could be continuously detected during post-implantation development. Consistently, we found that about one third of the surviving Pcgf6−/− embryos at 10.5 dpc exhibited growth retardation (Figure 6E). To determine the impact of Pcgf6 ablation during the pre-implantation stage, we examined WT and Pcgf6−/− ICMs (inner cell mass). We mated homozygous or heterozygous males with heterozygous females, and cultured the blastocysts in ESC inducing conditions until ESC-like colonies appeared. From 73 blastocysts collected, we could establish 22 ESC-like lines. Remarkably, among these 22 lines, not a single one was homozygous Pcgf6−/− (Figure 6F). As ESCs could not be established from Pcgf6−/− lines, we surmised that Pcgf6-deficient ICMs are functionally different from their WT counterparts. Collectively, these results reveal a role for PCGF6 in both pre- and peri-implantation development. A role of cPRC1 in the regulation of anterior-posterior (A-P) specification of the axial skeleton is well characterized (Akasaka et al., 1996; Isono et al., 2005; Suzuki et al., 2002). Given the essential role of PCGF6 in the PCGF6-PRC1 complex, we therefore asked whether Pcgf6−/− mice also exhibited defects in A-P specification. Intriguingly, we observed morphological alterations of the vertebrae that represent anterior transformations of the axis in these mice (Figure 6G,H). To further confirm the role of PCGF6 for A-P patterning, we then tested the impacts of PCGF6 over-expression and, indeed, observed posterior transformations of the axis (Figure 6—figure supplement 1C,D). We further found that skeletal alterations in Pcgf6−/− mice were accompanied by aberrant repression of Hoxb6 at the eighth pre-vertebra (Figure 6I). These suggest that PCGF6 regulates A-P patterning presumably through regulation of Hox genes. We then examined whether skeletal defects in Pcgf6−/− involved potential interactions of PCGF6-PRC1 with cPRC1 at Hox genes (Figure 1D, Figure 6—figure supplement 1E,F). We indeed observed that anterior transformations in Pcgf6−/− mice were suppressed by the Pcgf2 mutation, suggesting mutually counteracting properties of PCGF6 and PCGF2. 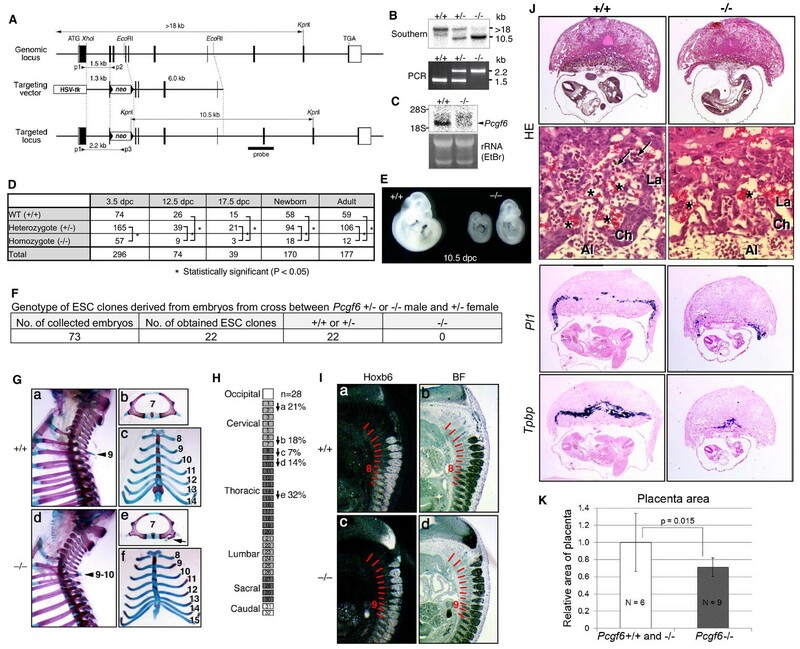 In addition to the skeletal phenotypes, we also noted significant reduction of placental size, manifested by hypoplasticity and malformation of the labyrinth layer, in the Pcgf6−/− mice (Figure 6J,K). In particular, the number of spongiotrophoblast cells and trophoblast giant cells (TGCs), identified by expression of Pl1 (placental lactogen-I, also known as Prl3d1) and Tpbpa (trophoblast specific protein alpha), respectively, was dramatically decreased. These findings demonstrate further roles of PCGF6 in peri-implantation development, including A-P specification and regulation of placental development. In the present study, we show that PCGF6 constitutes a non-canonical PRC1 complex, PCGF6-PRC1, that includes the core PRC1 component RING1B. PCGF6 physically interacts with RING1B, and plays a role in recruitment of RING1B to target genes, followed by deposition of H2AK119ub1 and transcriptional silencing. We have previously reported that the PCGF1-associated ncPRC1 (PCGF1-PRC1) recruits PRC2 to target genes (Blackledge et al., 2014). Here, we demonstrate that PCGF6-PRC1 also has a similar role, as ectopic targeting of a PCGF6 protein fused to the Tet repressor (PCGF6/TETR) to a pre-integrated TetO array leads to sequential binding of RING1B, H2AK119ub1 deposition and PRC2 recruitment in cis (Figure 3A). Like PCGF1-PRC1, PCGF6-PRC1-mediated targeting of PRC2 also takes place in endogenous genomic loci, in particular at promoters of a certain group of genes that are enriched for germ cell-specific and meiosis-specific functions (Figure 2—figure supplement 1D). However, these genes are distinct from those bound by PCGF1-PRC1 and canonical PRC1, which mainly include developmental genes (Figure 1D–G). Such developmental genes are evolutionarily conserved targets of PcG complexes, and are characterized by long CpG island (CGI) promoters that are usually not marked by DNA methylation (Sharif et al., 2013). The CXXC domain containing protein KDM2B recruits PCGF1-PRC1 into these loci by binding unmethylated CGIs (Blackledge et al., 2014). In contrast, PCGF6-PRC1 target loci tend to have slightly shorter and more DNA methylated CGIs (Figure 1—figure supplement 1E), where KDM2B seems to play distinct roles from PCGF1-PRC1. Indeed, H3K27me3 depositions at PCGF6-PRC1 targets are less active to recruit cPRC1 though underlying mechanisms await elucidative (Figure 1G, Figure 4—figure supplement 1C). Thus, our findings reveal that there are at least two major modes of gene silencing by PRC1; the first involves PCGF1-PRC1 and cPRC1 and silences developmental genes, while the second involves PCGF6-PRC1 and silences germ cell-specific and meiosis-specific genes (see the model in Figure 7A). Our model for the role of PCGF6-PRC1. (A) Schematic representation for two major modes of gene silencing by PRC1. The first involves PCGF1-PRC1 (PCGF6) and cPRC1 (MEL18/BMI1), which silences developmental genes, and the second involves PCGF6-PRC1 (PCGF6), which silences germ cell-related and meiosis-related genes. (B) Schematic representation of PCGF6-PRC1-mediated regulation of germ cell-related and meiosis-related genes in ESCs and pre-/peri-implatation embryos. By surveying DNA sequences of the PCGF6-PRC1 target genes, we find that they are enriched for the binding motif of the bHLHZ (basic helix-loop-helix, also containing a leucine zipper) transcription factor MAX (Figure 4—figure supplement 1D). Previous reports showed that MAX forms a heterodimer with MGA, another E-box binding protein (Hurlin et al., 1999). Interestingly, we identified MGA as a PCGF6 interacting factor by mass-spectrometry (Figure 1A,B), indicating that MAX and MGA may be directly involved in recruitment of PCGF6-PRC1 into target genes. Consistent with this hypothesis, both MAX and MGA were enriched at PCGF6-PRC1 target genes (Figures 1G, 4A and C); and depletion of MAX or MGA by siRNA caused a reduction of PCGF6 binding to these loci (Figure 4C). Previous studies show that the MAX/MGA heterodimer also plays a role in recruitment of the ncPRC1 component L3MBTL2 (Suzuki et al., 2016). Our results demonstrate that MAX/MGA independently associates with PCGF6 or L3MBTL2, as ablation of PCGF6 does not affect binding of L3MBTL2 (Figures 3E and 4D). These findings indicate that MAX/MGA represses target genes through multiple mechanisms that may function in parallel. Consistent with this notion, ESCs deficient for MAX or MGA show a more drastic phenotype than the Pcgf6-KO ESCs (Figure 6A,B,D) (Hishida et al., 2011; Washkowitz et al., 2015). Interestingly, L3MBTL2 associates with the H3K9me2 methyltransferases G9A and GLP (Ogawa et al., 2002; Qin et al., 2012). As G9A and GLP silence germ cell-specific genes in ESCs (Maeda et al., 2013), we speculate that L3MBTL2 contributes to transcriptional repression of these genes in association with G9A and GLP; while the same group of genes are silenced by a parallel pathway involving PCGF6 and RING1B (see the model in Figure 7B). The existence of several repressive epigenetic mechanisms that target germ cell-specific genes suggests the importance of preventing aberrant activation of such genes during pre- and peri-implantation embryonic development. Consistent with this idea, genetic ablation of Pcgf6 leads to growth defects in both ESCs and epiLCs (Figure 5C, D and E), stem cells lines that approximate pre- and post-implantation embryonic developmental stages, respectively. Furthermore, constitutive deletion of Pcgf6 causes impaired development of the placenta, in particular of the spongiotrophoblast layer and trophoblast giant cells (TGCs) (Figure 6J and K). Such aberrant phenotypes are also observed in the embryo proper, including defects in anterior-posterior (A-P) axis specification and ectopic expression of developmental genes such as Hoxb6 (Figure 6G, H and I). Taken together, we demonstrate a previously unappreciated function of the non-canonical PRC1 component PCGF6 for repression of germ cell-specific genes in ESCs. 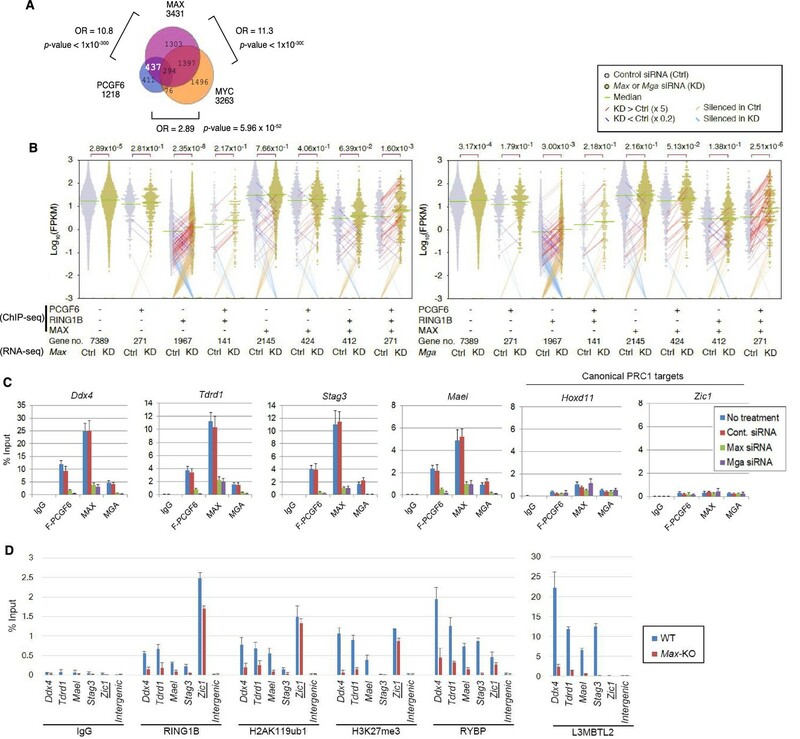 We further show that transcriptional silencing of such genes requires the function of RING1B and H2AK119ub1, but not PRC2 and H3K27me3. PCGF6-bound genes are enriched for short CGIs, frequently marked by methylated DNA, and are not bound by PCGF1-PRC1. Indeed, developmental genes, which are the main targets of PCGF1-PRC1, are not bound by PCGF6-PRC1, revealing distinct functional roles of these two ncPRC1 complexes. Consistent with this model, PCGF6-PRC1 is recruited to target sites by the MAX/MGA heterodimer, while PCGF1-PRC1 is recruited by the unmethylated CpG binding protein KDM2B (Farcas et al., 2012). 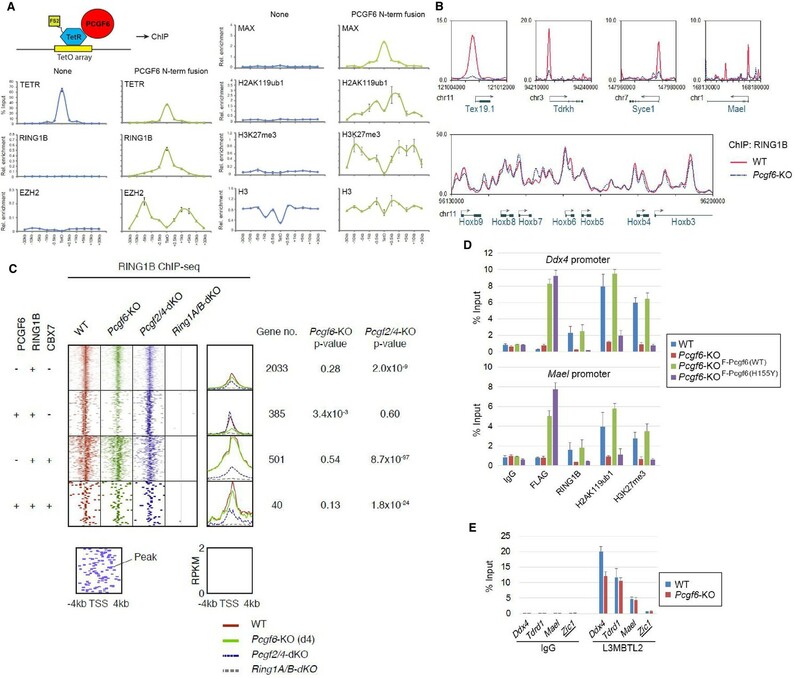 Our work thus shows a link between sequence specific DNA binding by the MAX/MGA heterodimer with PRC1-mediated transcriptional silencing of germ cell-specific genes by PCGF6, for regulation of pre- and post-implantation embryonic development. The full length mouse Pcgf6, mouse Pcgf2, mouse Ring1B, and mouse Max were PCR-amplified and inserted into a pCAG-IRES-Puro, a pCAG-IRES-BlaS, or a pCAG-IRES-HisD eukaryotic expression vector (Kindly gifts from Dr. Hitoshi Niwa in Kumamoto University) that was modified to express an N-terminal Flag and 2XStrep2 tag, an N-terminal 3xFlag tag, or an N-terminal HA tag. All PCR generated constructs were verified by sequencing. Mutations of the PCGF6 RING-finger domain (H155Y) and the MAX basic domain (L31V and E32D) were introduced into the wild type Pcgf6 and Max constructs, respectively, using the PrimeSTAR Mutagenesis Basal Kit (Takara, Japan). The RING1B mouse monoclonal antibody has been described previously (Atsuta et al., 2001). A rabbit polyclonal antibody against the Flag-2XStrepII sequence was generated as described previously (Farcas et al., 2012). Commercially available antibodies were used to detect FLAG-tag (Sigma-Aldrich, St. Louis, MO,, F1804, RRID:AB_262044), HA-tag (Santa Cruz, Dallas, TX, sc-805), RYBP (Millipore, Billerica, MA, AB3637, RRID:AB_631618), L3MBTL2 (Active Motif, Carlsbad, CA, 39569, RRID:AB_2615062), MAX (Santa Cruz, sc-197X, RRID:AB_2281783), MGA (Bethyl, Montgomery, TX, A302-864A, RRID:AB_2615457), PCGF1 (Santa Cruz, E-8: sc-515371), PCGF2 (Santa Cruz, H-115: sc-10744, RRID:AB_2267885), PCGF6 (ORIGENE, Rockville, MD, TA324658), EZH2 (Cell Signaling, Danvers, MA, 4905, RRID:AB_2278249), SUZ12 (Cell Signaling, 3737, RRID:AB_2196850), SET1 (Bethyl, A300-289A, RRID:AB_263413), trimethylated Histone H3 lysine 27 (H3K27me3) (Millipore, 07–449, RRID:AB_310624), dimethylated histone H3 lysine 9 (H3K9me2) (MBL, Japan, MABI0317), H3K27ac (Cell Signaling, 8173, RRID:AB_2616015), monoubiquitinated histone H2A lysine 119 (H2AK119ub1) (Millipore, 05–678, RRID:AB_309899; Cell Signaling, 8240, RRID:AB_10891618), mouse IgM (Millipore, 12–488, RRID:AB_390193), histone H3 (Millipore, 07–690, RRID:AB_417398), and LAMIN B (Santa Cruz, sc-6216, RRID:AB_648156). Targeting vectors to knock out Pcgf6 (Figure 1—figure supplement 1A) were introduced into R1 or M1 ESCs. Chimeras were generated by the morula aggregation method. Conditional mutants were mated with Rosa26::CreERT2 (ERT2-Cre) transgenic mice purchased from Artemis Pharmaceuticals (Germany)(Seibler et al., 2003). ESCs were generated from respective blastocyst embryos as described previously (Endoh et al., 2008). Male ESCs were used in this study. 4-hydroxy tamoxifen (OHT) at a final concentration of 800 nM was added to culture medium to induce Cre recombinase activity and delete Pcgf6. Cbx1/Cbx3 conditional KO ESCs (Figure 3—figure supplement 1E) were generated as described above. Ring1A−/−; Ring1Bfl/fl; Rosa26::CreERT2tg/+ ESCs (Endoh et al., 2008), Pcgf2/4-dKO ESCs (Elderkin et al., 2007), Kdm2b-KO ESCs (Blackledge et al., 2014), and Max conditional KO ESCs (Hishida et al., 2011) were described previously. For generation of ESC lines stably expressing exogenous cDNAs, 5 μg of the expression constructs were transfected into ESCs using electroporation and stable transfectants were selected using 1.0 μg/mL puromycin as described previously (Endoh et al., 2012). Prior to their use in ChIP experiments, ESCs were cultured for two passages under feeder-free conditions. All ESC lines used in this study were tested negative for mycoplasma before use. All animal experiments were carried out according to the in-house guidelines for the care and use of laboratory animals of the RIKEN Center for Integrative Medical Sciences, Yokohama, Japan [Approval number: Kei-27-001(7)]. All gene recombination experiments were carried out according to the in-house guidelines for the genetic recombination experiments of the RIKEN Center for Integrative Medical Sciences (Approval number: Sho-Y2015-018-10). The siRNAs for Max and Mga were selected according to a previous report (Maeda et al., 2013) and purchased from Qiagen (Germany). ES cells were transfected with individual siRNAs using Lipofectamine RNAiMAX reagent (Thermo Fisher Scientific, Waltham, MA) according to the manufacturer’s instructions. To purify PCGF6 and associated proteins, a mouse ESC line stably expressing Flag-2XStrepII-tagged PCGF6 was generated. Nuclear extracts were isolated from this cell line, the PCGF6 complex was affinity purified, and the co-purified proteins were subject to mass spectrometry as described previously (Farcas et al., 2012). Cells expressing each of the tagged constructs were suspended in IP buffer [10 mM Tris-HCl (pH8.0), 1 mM EDTA, 140 mM NaCl, 0.4% NP-40, and 0.5 mM PMSF] and sonicated for several seconds. After centrifugation, the supernatant was collected, and then incubated with anti-FLAG antibody (Sigma-Aldrich; M2) for 120 min at 4°C. The immune complexes were captured by incubation with protein A/G magnetic Dynabeads (Invitrogen, Carlsbad, CA) for 60 min at 4°C. The bead-bound proteins were washed with IP buffer, eluted in SDS sample buffer under reducing condition, separated on SDS-PAGE gels, and subjected to western blot analysis. Tandem mass spectrometry (LC–MS/MS) was performed as described previously (Farcas et al., 2012). Materials eluted with desthiobiotin were collected and precipitated using chloroform/methanol and re-suspended materials were subjected to in-solution tryptic digestion followed by nano-liquid chromatography-tandem mass spectrometry (nLC-MS/MS) analysis using a nano-Acquity UPLC (Waters, Milford, MA) coupled to an Orbitrap Velos/Elite mass spectrometer (Thermo Fisher Scientific). MS/MS spectra were searched against the UniProt SwissProt Mouse database (16,683 sequences) in Mascot v2.3.01. Protein assignment was based on at least two identified peptides. Mascot scores and peptide coverage are indicated for each protein (Figure 1B). Total RNA was extracted using the RNeasy Mini kit (Qiagen) with the RNase-Free DNase Set (Qiagen) according to the manufacturer's instructions. Genomic DNA-free RNA samples were further purified using the RNeasy kit RNA cleanup protocol. For subsequent RT-PCR analysis, cDNA was synthesized with the SuperScript III First-Strand Synthesis System (Thermo Fisher Scientific). Quantitative real-time PCR was performed by using the Brilliant III SYBR Green QPCR Master Mix (AgilentLaboratories, Santa Clara, CA), using Gapdh as housekeeping gene. For RNA-seq studies, RNA integrity was assessed on a BioAnalyzer; all samples had a RNA Integrity Number (RIN) ≥9.5 (Agilent Laboratories). Sequencing libraries were generated according to Illumina’s instructions and sequenced on the Illumina HiSeq platform as described previously (Sharif et al., 2016). Chromatin immunoprecipitation (ChIP) was performed as previously described (Endoh et al., 2012), with minor modifications. Sonication was performed using a Covaris focused-ultrasonicator (Covaris, Woburn, MA) to produce fragments of approximately 0.5–1 kb. Immunoprecipitation was performed overnight at 4°C with approximately 2–5 µg of antibody and chromatin corresponding to 5 × 106 cells. Antibody bound proteins were isolated on protein A/G magnetic Dynabeads (Invitrogen), washed extensively, eluted, cross-links were reversed, and then the samples were sequentially treated with RNase and proteinase K before being purified using phenol-chloroform extraction. Real-time qPCR was performed using the Brilliant III SYBR Green QPCR Master Mix (Agilent). For H2AK119u1-ChIP using E6C5 (Millipore #05–678), pre-cleared chromatin from 2–3 × 106 cells was incubated with 40 ul of E6C5 antibody (Millipore #05–678) (overnight, 4°C), and 30 ul of original Protein A dynabead slurry (Invitrogen) was incubated with 3 ug (=3 ul) of rabbit anti-mouse IgM antibody (Millipore #12–488) (overnight, 4°C). Next day, the chromatin-1st antibody complexes were immunoprecipitated with second antibody - preconjugated protein A dynabeads, and subjected to the conventional ChIP experiments as described above. ChIP-seq libraries were prepared according to Illumina’s instructions accompanying the NEBNext ChIP-Seq Library set (NEB, Ipswich, MA, #E6200) and quantified by the KAPA Library Quantification Kit (KAPA, Wilmington, MA), and their sizes were confirmed by Bioanalyzer (Agilent). Libraries were sequenced using Illumina (San Diego, CA) HiSeq system as described previously (Isono et al., 2013). The peak calling of ChIP-seq data was performed with MACS2 program. Published ChIP-seq data for CBX7, MAX, and MYC were obtained from NCBI GEO (accession numbers GSM1041373, GSM1171650, GSM1171648, respectively). Published ChIP-seq data for RING1B in wild-type and Kdm2b-KO ESCs were also obtained from NCBI GEO (Series GSE55698). Binding motifs of PCGF6, RING1B, CBX7, MAX and MYC were detected using a computer program DREME included in the motif analysis suite MEME version 4.9.1 (http://meme-suite.org/). Briefly, 500 bp sequences around the centers of ChIP-seq peaks were collected from the mouse genome and enriched motifs were calculated using the above program with default parameters. Graphical representation of the sequence logo, where letter height was determined by Shannon entropy, was generated using our in-house program. E14 mouse ES cells containing a single copy of TetO BAC were generated as described previously (Blackledge et al., 2014). Mouse Pcgf6 or Max coding sequence was inserted into pCAGFS2TetR to generate a mammalian expression plasmid for N-terminal FLAG STREPx2 (FS2) tagged PCGF6 or MAX, respectively. Either of these plasmids was transfected into the TetO-containing ESCs and stable clones expressing TetR-PCGF6 or TetR-MAX fusion protein were detected in ChIP experiments using an FS2-specific antibody as previously described (Blackledge et al., 2014). PGCLCs were induced from Pcgf6fl/fl ES cells through an epiblast-like state as described previously (Hayashi et al., 2011; Hayashi and Saitou, 2013). Briefly, the ESCs were first cultured in 2i (MEK inhibitor PD0325901 and GSK-3 inhibitor CHIR99021)-containing media without a feeder layer for 3 days (from day −5 to day −2 in Figure 5C) and then subjected to EpiLC induction culture by using media containing Activin A and bFGF for 2 days (from day −2 to day 0). Induced EpiLCs were further differentiated into the germ cell-linage by culturing them with BMPs, SCF, LIF, EGF and others for 6 days (from day 0 to day 6). The impact of PCGF6 loss at different stages was tested by adding OHT at day −5, day −2, or day +2 (Figure 5C). Skeletal preparations were made from newborn mice and cleared skeletons were analyzed under a stereomicroscope as described previously (Akasaka et al., 1996). RNA in situ hybridization was performed as described previously (Akasaka et al., 1996). Sequencing and microarray data can be accessed via the geo accession GSE84480 (http://www.ncbi.nlm.nih.gov/geo/query/acc.cgi?token=wdmlougulbwbtgr&acc=GSE84480) and GSE87484 (https://www.ncbi.nlm.nih.gov/geo/query/acc.cgi?token=sbebmckgtlyhlat&acc=GSE87484). Methods in Molecular Biology 1074:175–183. Molecular and Cellular Biology 25:6694–6706. Molecular and Cellular Biology 31:351–364. Current Opinion in Cell Biology 25:305–313. Molecular & Cellular Proteomics 10:M110.002642–002642. Thank you for submitting your article "PCGF6-PRC1 suppresses premature differentiation of embryonic stem cells by silencing germ cell-related genes" for consideration by eLife. Your article has been reviewed by three peer reviewers, and the evaluation has been overseen by Robb Krumlauf as a Reviewing Editor and Kevin Struhl as the Senior Editor. The following individual involved in review of your submission has agreed to reveal his identity: Giacomo Cavalli (Reviewer #3). This study presents an interesting investigation into the role of the PRC1 cofactor PCGF6 in PRC1-mediated gene silencing. Following up on the recent characterization of non-canonical PRC1 sub-complexes the authors investigate the function of one such sub-complex containing the PCGF6 protein. 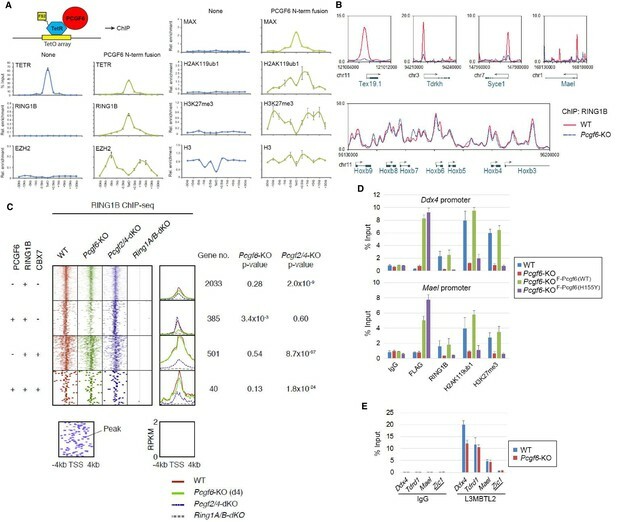 They present data suggesting that PCGF6 is involved in the recruitment of non-canonical PRC1 to a subset of genes that encode germ cell regulators. Mechanistically, they propose that recruitment of PCGF6-PRC1 is mediated by MAX/MGA transcription factors. Although the subject of the study is important in the field of Polycomb biology, the data presented lack clear evidence for a role of MAX in recruitment. It remains mostly correlative and does not provide direct evidence that MAX/MGA transcription factors recruit PCGF6-PRC1. There are a number of other concerns, controls and clarifications that need to be addressed in a revision before the study can be considered for publication. 1) A major concern of the work is that the evidence for a role of MAX in specifying PCGF6-PRC1 recruitment is overstated. Motifs enriched within PCGF6 binding sites are not exclusive to MAX. The effects of MAX knockdown on gene expression and observations based on the DNA-binding mutant of MAX do not rule out an indirect mode of action. There is no demonstration direct MAX-mediated recruitment of PCGF6-PRC1 with the enforced tethering system used in the study. The mass spectrometry data uncover an interaction with MGA, but not MAX. Hence, one of the major conclusions of the study is not adequately demonstrated by the data presented in the manuscript. The authors must demonstrate direct MAX-mediated recruitment of PCGF6-PRC1 with the enforced tethering system or alternative approach. If a Tet-MAX can recruit the PCGF6 ncPRC1 complex this would support their conclusions. 2) In Figure 1G, it would help if a control Flag-Strep ChIP seq (i.e. of an FS2-empty vector cell line) is included alongside the FS2-Pcgf6 ChIP seq to understand the background signal in the experiment. This would ensure that all of the Pcgf6 signal shown is real. The reason for this is that sequencing of input chromatin alone often shows weak enrichment at transcription start sites relative to other regions of chromatin. Therefore, this requested control ChIP-seq would eliminate any doubt about the signal shown for FS2 tagged Pcgf6. 3) A suggestion to improve the paper would be to move the Figure 6—figure supplement 1A-I to the main figures as this data unequivocally shows the biological importance of Pcgf6. The developmental defects identified in the absence of Pcgf6 in vivo are much starker than the in vitro differentiation defects currently featured in Figure 6. 4) In the subsection “PCGF6 forms complexes with PRC1 components”, the authors purify the PCGF6-PRC1 complex and report copurification of CBX1 and CBX3 (HP1) proteins. This is an intriguing result that could link this complex to H3K9me3 and heterochromatin. Later, they confirm the presence of L3MBTL2 at GF6-PRC1 target genes. In the second paragraph of the subsection “PCGF6 recruits RING1B to target genes and facilitates downstream H2K119ub1 deposition” and Figure 3 the authors show ChIP-seq of RING1B in WT and Pcgf6-KO ESCs. In light of the presence of HP1 proteins (as well as G9a and GLP, at least following Ogawa et al. 2002) in the PCGF6-PRC1 complex, it would be really important to perform ChIP-seq of H3K9me2 in the same condition. Likewise, KD of CBX1 and CBX3 followed by RT-PCR would help understand whether K9me2-HP1 repressive chromatin does contribute to silencing of PCGF6-PRC1 target genes. […] Although the subject of the study is important in the field of Polycomb biology, the data presented lack clear evidence for a role of MAX in recruitment. It remains mostly correlative and does not provide direct evidence that MAX/MGA transcription factors recruit PCGF6-PRC1. There are a number of other concerns, controls and clarifications that need to be addressed in a revision before the study can be considered for publication. We thank you for these critical comments and suggestions. Although we failed to detect MAX in our mass spec analysis, we found a considerable association of MAX with FLAG-PCGF6 by IP-immunoblotting with several negative controls as shown in the revised Figure 1C. In addition, we further showed co-existence of MAX with PCGF6 mainly at PCGF6-bound genes irrespective of RING1B binding as shown in Figure 1G. We further confirmed the enforced tethering of PCGF6 efficiently brought MAX as shown in the revised Figure 3A. We have revised the text accordingly. Upon the request, we further examined whether the enforced tethering of MAX could recruit PCGF6-PRC1. We expressed MAX/TETR and ectopically tethered this fusion protein to a pre-integrated TetO array in ESCs (Figure 4—figure supplement 2E). ChIP-qPCR analysis showed binding of the MAX/TETR fusion protein at the TetO array, which accompanies mild enrichments of HA-tagged PCGF6, H2AK119ub1 and H3K27me3 (Figure 4—figure supplement 2E) while barely RING1B (data not shown). These data again support MAX-dependent recruitment of PCGF6-PRC1 though its impact is limited in this experimental setup. We guess this limited effect of MAX/TETR to recruit PCGF6 could be due to a potential dimerization of MAX with other partners than MGA in this experimental setup. We revised the main text (subsection “Interactions between MAX and PCGF6 play a role in ESC maintenance”, last paragraph) accordingly. Thank you for this suggestion. We included a control Flag ChIP-seq data (obtained from a Flag-empty vector cell line) alongside the Flag-PCGF6 data in Figure 1G (shown as NC) to ensure the Flag-PCGF6 signal shown is real. We appreciate your suggestion and moved these figures to Figure 6 in the revised version. Thank you for your important suggestion. We performed ChIP-seq for H3K9me2 and the summary of data is included in Figure 3—figure supplement 1D. Unlike L3mbtl2-KO ESCs (Qin et al., 2012), we did not observe considerable changes in H3K9me2 levels in Pcgf6-KO. Consistent with this we also showed L3MBTL2 bound to the targets in Pcgf6-KO. We suggest L3MBTL2/G9A axis acts in parallel with PCGF6/RING1 pathway within the same complexes. Indeed, we also found L3MBTL2 bound to the targets in MAX-dependent manner. MAX/MGA heterodimer likely recruit PCGF6 and L3MBTL2 mutually independently as summarized in Figure 7. We also performed RNA-seq analysis of Cbx1/3-double knockout (dKO) ESCs to investigate the role of CBX1/3 for the regulation of PCGF6-PRC1 targets (Figure 3—figure supplement 1E). We did not observe a significant change in the expression levels of PCGF6+CBX7-RING1B+ in Cbx1/3-dKO ESCs, suggesting CBX1/3 have, if any, a marginal role for the repression of PCGF6-PRC1 targets (Figure 3—figure supplement 1F). We revised the main text (subsection “PCGF6 recruits RING1B to target genes and facilitates downstream H2AK119ub1 and H3K27me3 deposition”, last paragraph) accordingly. We thank Dr. Natsumi Shimizu in RIKEN CDB for providing technical advice for mouse early embryos. This work was supported by Grant-in-Aid for Scientific Research on Innovative Areas (#26112516 to ME), Grant-in-Aid for Young Scientist (B) (# 25871129 to ME) and Grant-in-Aid for Scientific Research (C) (#16K07372 to ME) from Ministry of Education, Culture, Sports, Science and Technology (MEXT) of Japan. HK is a recipient of the Strategic Basic Research Programs, CREST grant. Animal experimentation: All animal experiments were carried out according to the in-house guidelines for the care and use of laboratory animals of the RIKEN Center for Integrative Medical Sciences, Yokohama, Japan [Approval number: Kei-27-001(7)]. © 2017, Endoh et al.